The plethora of lip-reading videos online is excessive, but every once in a while a great one comes along. 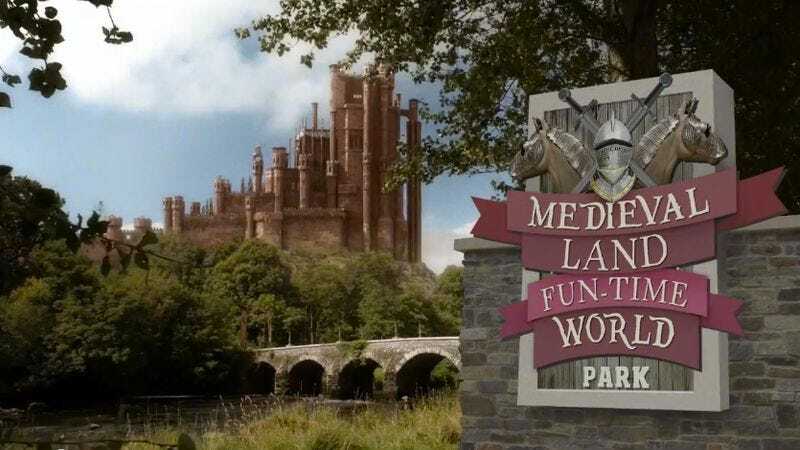 This one is the result of repurposing Game Of Thrones clips to turn Westeros into “Medieval Land Fun-Time World.” It changes the complicated political machinations and civil war into Adventureland, if it took place at a Renaissance Faire. Ned Stark needs to get the park ready to open otherwise he goes “back to the finger painting college.” Sansa talks smack to Joffrey, who’s still getting slapped and punched all over the place. Danaerys sounds like a drugged-out valley girl. The Kingslayer is a whisperer who’s working on a gravity belt. And Littlefinger cooks kitten meat burgers for everyone, which freaks out Ned and King Robert. It gets a bit heavy on the scatological humor by the end, and Tyrion’s accent is a bit disappointing, but otherwise it’s a hilarious reimagining of the high fantasy series as a screwball theme park comedy.